A great weeknight meal is a heaping bowl of mussels & clams in white wine with crusty bread & a bottle of crisp Verdicchio D.O.C. 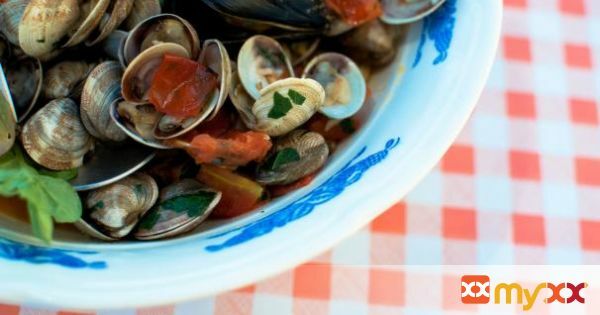 This dish literally is done in 5 minutes - it takes longer to clean the mussels and cut the tomatoes than the actual cooking time! You can add pasta to it if you like (spaghetti or linguini) but the fresh little clams are so sweet & delicious, this is one time there is no need for pasta! 2. Turn the heat up, add in chili flakes & clams - cook about 30 seconds to 1 minute. Then add in the mussels. Turn up the heat and toss in the cherry tomatoes, sauteing for a moment or two. 3. Next add a half glass of white wine and cover. Allow to sit covered 1-2 minutes at most until the shells open. Then shut off the heat, add in your parsley. Finish with a bit of butter or good glug of olive oil. Top with arugula if you like. 4. Serve immediately with plenty of good crunchy bread to dip & white wine wine.